Why is Ganesha equated with the primordial sound pranava (OM)? Because Ganesha represents the knowledge prana, the vital breath. Out of the pranava, the product of prana, the vocal language develops, after passing through four stages - para, pashyanti, madhyama and vaikhari. Para is the source and the subtlest stage, while vaikhari is the grossest, representing the bursting out of vocal language. The state prior to para is "Love to be", the sense of love, which gives rise to all activities. That state is Ganesha. 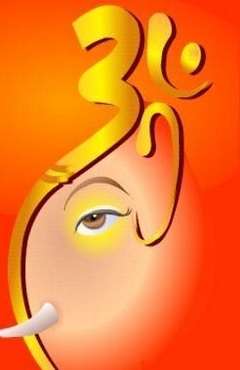 *Ganesha is a hindu God who is worshipped as the first God - Lord of beginnings. Read more about the four types of speech in this post. Very educative and wonderful blog.Nandini,you have created 2 very good blogs. Namaskaram Abhiram ji. I am happy to have you as a visitor to these blogs. Thank you so much for taking your time to post your comments. I truly appreciate that. Please continue visiting. Nandini ji thank you for sharing auspicious things to all of us. You are welcome :) Thank you so much for taking your time to write a note of acknowledgment. God bless us all.